The BBC Trust rejected appeals against Nick Griffin’s invitation to appear on Question Time, saying it was “a question of editorial judgment”. BBC Director General Mark Thompson writes in the Guardian, “It is [because of the BNP’s electoral success] – not for some misguided desire to be controversial … that the invitation has been extended.” But BBC presenter Michael Rosen accused the broadcaster of “hiding behind” the BNP’s European election victories to justify its decision. Kawsar Zaman from the Muslim Council of Britain said, ”I’m a young Muslim whose been brought up here, I’ve had so many opportunities through the education system and through the NHS, but what the BNP stands for is completely against those principles that Britain stands for, which are fairness, justice and equality.” On the Today programme, Ken Livingstone accused the BBC of being “evasive on this question of violence [which follow racist groups].” Nick Griffin, interviewed by the Times, thanked the BBC and praised the “hysterical” reaction of the political elite for giving his far-right British National Party unprecedented publicity. He also accused President Obama of being an “Afrocentric racist bigot” whose comments about the legacy of slavery would encourage black youths to attack white children. 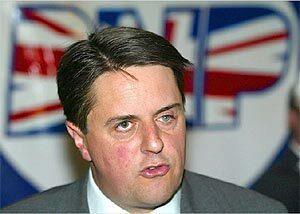 Meanwhile, the BNP is facing an Electoral Commission fine of up to £5,000 for failing to file its accounts on times. Regional accounts for 2008 show the party had suffered a 27 per cent drop in its income to £211,000. Following his meeting with US Secretary of State Hilary Clinton, William Hague defended his party’s far right alliance in Europe. He said the behaviour of Michal Kaminski, who refuses to apologise for a 1941 massacre of Jews, was not consistent with anyone who was antisemitic while describing his Latvian partners, who every year celebrate the Latvian Waffen SS, “a respectable party … To suggest it is antisemitic or neo-Nazi is ludicrous.” But Nile Gardiner, an Anglo-American specialist at the conservative Heritage Foundation said, “There could be storm clouds on the horizon … Significant long-term potential exists for a clash between a Cameron government and the Obama administration over Europe.” Meanwhile, Hague has privately warned European ambassadors that backing Tony Blair as European Union president would be a “mistake” that would further set back relations if the party came to government. A poll conducted by YouGov for the left-wing pressure group Compass showed that the public, by 55 per cent to 34 per cent, would like to see Peter Mandelson more directly involved in securing a Royal Mail settlement. The Communication Workers’ Union accused Mandelson of being a minister without responsibility and said that he had colluded with Royal Mail’s top two executives to undermine peace talks. The government will involve the judiciary in a consultation hoping to bring down the use of “super injunctions” like that used by Carter-Ruck against the Guardian over Trafigura. But Justice Minister Bridget Prentice said the Guardian had received erroneous legal advice and was not actually banned from reporting Farrelly’s parliamentary question in the first place. Gerald Howarth, the Tory shadow defence minister, said MPs should take care before interfering with the decisions of courts. In this case, Howarth said, the court found that an injunction was the right thing to do. The Washington Post reveals that Barack Obama intends to cut the salaries of executives of the bailed out banks by about half on average, insituting a pay cut of about 90 percent compared with last year. In the UK, Lord Myners, the City minister, warned bankers that “exorbitant” bonuses would not be tolerated while insisting that the government could not use its stakes in the bailed out banks to stop bonus payouts.